You are buying the Dechra Puralube Ophthalmic Eye Ointment And Lubricant 3.5 Grams, model #21138. 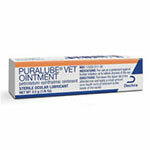 At ADW Diabetes, we offer a wide selection of Dechra products for cats and dogs. Trust ADW Diabetes for all of your pet grooming and health care needs. The Dechra Puralube Ophthalmic Eye Ointment And Lubricant 3.5 Grams is used as a lubricant to prevent further irritation, or to relieve dryness of the eye. It is also excellent as a protectant during bathing or grooming and as a lubricant for procedures which require an anesthetic to be used. Prevents further irritation to eye. Contains: White Petrolatum and light mineral oil.